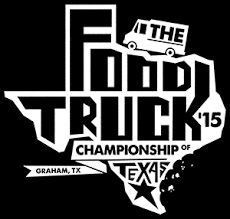 The Food Truck Championship of Texas is a free admission, all day battle of the best. Food trucks from all across Texas gather in the one place big enough to hold all the food, friends, and fun—America’s Largest Downtown Square in Graham, Texas. Food Truck Championship contestants will be competing for a grand prize of $10,000 and we invite you to have a taste of the fiery competition. In conjunction with the Championship, the Graham Chamber of Commerce will be hosting the annual Possum Pedal Bike Ride, and later that night at the historic Graham Drive In, Robert Earl Keen will be live in concert. There will be plenty of activities to entertain the entire family on the square from 11:00 a.m. to 7:00 p.m. You will not want to miss any part of this exciting day! This entry was posted on Wednesday, May 20th, 2015 at 4:04 pm	and is filed under Events, News & Updates. You can follow any responses to this entry through the RSS 2.0 feed. Both comments and pings are currently closed.